Altaro VM Backup is a fast, affordable, high performance backup and replication solution. We’ve cut the waste and hassle to give you an agile, streamlined solution that is easy to implement, feature-rich, with outstanding support as part of the package. Up and running quickly, without the need for complex configurations! With Altaro VM Backup, you can install and run your first virtual machine (VM) backup in less than 15 minutes. Get up and running quickly, without the need for complex configuration or software dependencies. 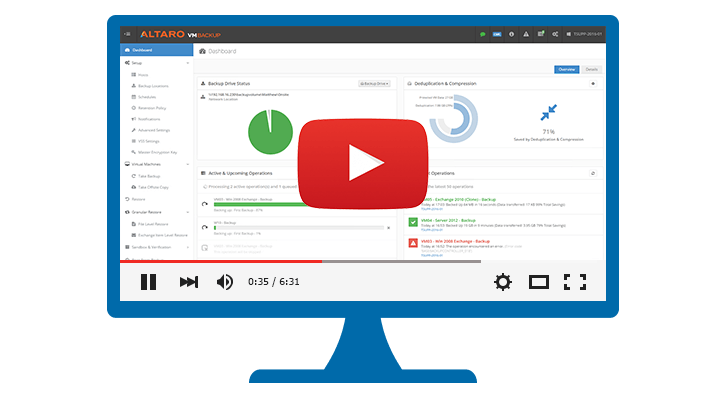 Altaro VM Backup is designed to give you the power you need, without the hassle and steep learning curve. Altaro gets you up and running in less than 15 minutes! Managing and configuring backup/restore jobs across multiple hosts has never been simpler. Powerful functionality, easy to use - Offsite backup replication (with WAN acceleration), granular restore options for individual files and Exchange items, automated backup verification, and more! WAN-Optimized Replication - VMs can be replicated to a remote site continuously, dramatically improving the Recovery Time Objective (RTO). Continuous Data Protection (CDP) – VMs can be backed up as frequently as every 5 minutes, ensuring that in a data loss scenario, only a few minutes of data are lost, significantly optimizing the Recovery Point Objective (RPO). 256-bit AES encryption – All Altaro offsite backup copies automatically benefit from 256-bit AES encryption through the secure passphrase you configure upon initial setup. Encryption is optional for local backups. RMM integration – Use the Altaro VM Backup with Connectwise Automate (LabTech) Plugin to automatically raise Alerts and Tickets in your ConnectWise Automate Control Center. Support for two factor authentication (2FA) in Altaro’s online management platform, Cloud Management Console (CMC). Altaro VM Backup with Augmented Inline Deduplication drastically reduces your storage requirements for your backup repository. When compared to other vendors, it is the best deduplication in the industry creating the smallest backup size. Our deduplication runs across all backup jobs, you don’t need to group virtual machines together (no use of post processing). Requiring the least amount of backup space is only one of the benefits;Augmented Inline Deduplication also improves backup and restore speed. Much lower storage requirements. When compared to other vendors Altaro creates the smallest backup size! Best deduplication in the industry not only for creating the smallest backup size but uses Variable Block Size for best efficiency. Grandfather-Father-Son Archiving (GFS) - In addition to your continuous and daily backups, you can also archive different backup versions by setting up separate backup cycles to store a new backup version every week, every month and every year. No matter how good a solution is, every environment is unique and unexpected issues do happen. If something goes wrong, you need to be able to rely on fast, knowledgeable and effective support. And this is precisely our commitment to you! Virtual machine backup and replication software packed with powerful features for Hyper-V and VMware. Unbeatable value – Avoid bloated prices! We charge per host, not per socket, CPU or VM. Watch a 10 min Demo. "Altaro Support and software is second to none! I can't say enough good things about Altaro!" "Nice to see a company that actually has customer support that can fix problems. 10 out of 10." 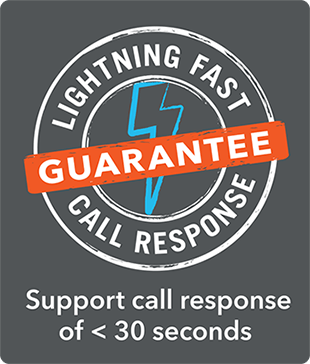 "Great product, great support, great cost per value...An absolute buy for any server administrator." "You have a really great product that just works. Keep it up!" "Your support was simply stellar. I have rarely encountered such excellent product support anytime, anywhere." "The offsite feature of the Altaro backup saved a customer from a very nasty ransomware attack." "Altaro gives us system administrators ease of mind because the program does its work flawlessly! Keep up the good work!" "I am a huge fan of Altaro VM Backup. 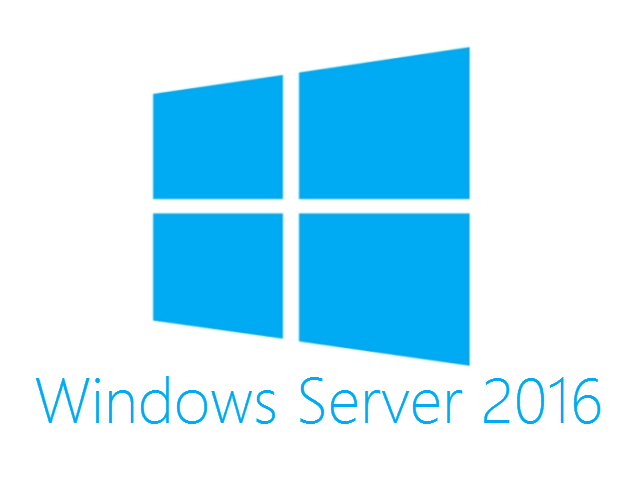 I have recommended it several times on Spiceworks when people were looking for Hyper-V backup solutions. It is easy to use and has a lot of enterprise-class features and is reasonably priced." 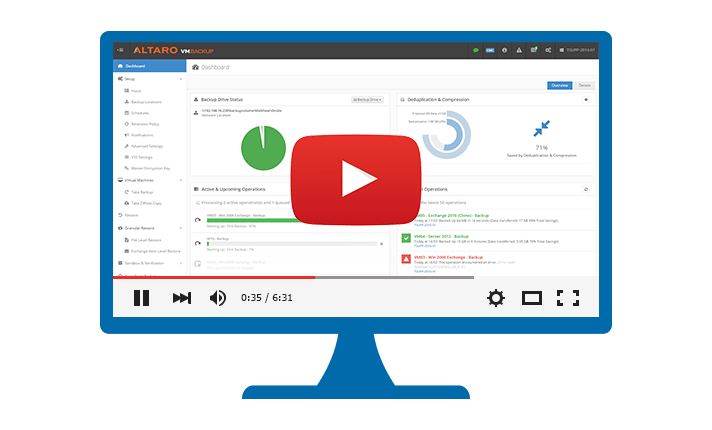 Learn how Altaro VM Backup can help with your GDPR compliance activities. Free Webinars by MVPs & vExperts. Join us today!